After Levi Leipheimer opened up a 21-second lead on Jens Voigt in the Friday time trial, it looked like Leipheimer had nailed down the win. With a Discovery Channel squad that had controlled the race pace and only 2 stages to go, it looked like Leipheimer would go wire-to-wire to take the 2nd annual Tour of California. But CSC, the world's top-rated squad, wasn't ready to concede. They pushed the pace all day, trying to spring Jens Voigt, and eventually getting Stuart O'Grady, 5th overall 1:20 behind Leipheimer, into a break with 8 others, including Slipstream's Danny Pate, T-Mobile's Michael Rogers, and Quick Step's Bram Tankink. The gap rose to more than 3 minutes, and Discovery put all hands into the chase, including George Hincapie, who didn't yet realize he had broken his wrist early in the stage in an accident with teammate Tony Cruz. The news is bad for Hincapie, the US road champion: He's expected to miss the spring classics, a group of races in which he's traditionally excelled. 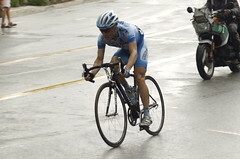 As the break approached the finishing laps of Santa Clarita, O'Grady took monster pulls, but couldn't hold off the peloton, which made the catch with less than 5 kilometers to ride, apparently locking up Leipheimer's overall win. It was a titanic battle between CSC and Discovery Channel. Gerolsteiner made a move to set up Robert Förster in the last kilometer, but left him on his own too soon. The sprinters enveloped Förster, with Freddie Rodriguez getting tangled with the Gerolsteiner rider. Meanwhile, Juan José Haedo puled an almost McEwen-like act, appearing right against the storm fencing and just outkicking the likes of Thor Hushovd, Greg Henderson, Paolo Bettini, and Luca Paolini. T-Mobile's Henderson was 2nd, with Bettini 3rd. 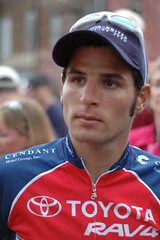 The win was the 4th for Haedo over the race's 2 years. Credit Agricole's Christophe Laurent locked up the overall king of the mountains title, despite the efforts of Quick Step's Jurgen Van De Walle, who outscored Laurent at 3 of 4 KoM primes on the day. Haedo is strongly placed for the points classification, and Levi Leipheimer looks to have sewn up the overall, with just 77.5 kilometers left to race on Sunday. 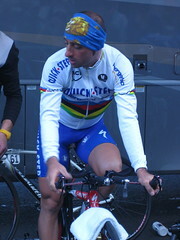 3) Paolo Bettini, Italy, Quick Step-Innergetic, s.t. 4) Thor Hushovd, Norway, Crédit Agricole, s.t. 5) Fred Rodriguez, USA, Predictor-Lotto, s.t. 6) Robert Förster, Germany, Gerolsteiner, s.t. 7) Luca Paolini, Italy, Liquigas-Bianchi, s.t. 8) Alex Candelario, USA, Jelly Belly, s.t. 9) Alejandro Acton, Argentina, Colavita-Sutter Home, s.t. 10) Russell Downing, Great Britain, Health Net-Maxxis, s.t. I've been trying to follow the Tour of California through the race's official website, and its very pretty Tour Tracker, but I've been unable to get into it during the race most days. I've been making do with the usual race diet of text updates from CyclingNews.com and VeloNews, and meaning to get back in to check out the Tour Tracker. I've gotten in before and after stages, and thought I therefore had an idea what the Tracker does, but I was woefully mistaken. I thought it was just another GPS and map interactive tracker, but with nicer graphics. It is so much more than that. In fact, the Adobe Flex and Flash-based application also includes streaming live video, which, by default, displays at the full size of your browser window, with the translucent panels overlaid over the video but still active. Mark Shimahara of BikeZen.com is adding photos during stages, and including Flickr in the distribution. In the right sidebar, there's a scroll of the VeloNews live ticker. It's not perfect: It seems likely that the app's load time and its unavailability during stages are related. There are reports of browser incompatibilities, and some of the information could be handled better: I would rather they use the “Tour Standings” panel for intermediate sprints and KoM points, especially since they're not keeping that updated (tonight it's still showing standings from before today's stage). But that's complaining about pigeons on the Statue of Liberty: When it's working, this app combines the best of Cycling.TV, VeloNews, excellent cycling photography, and real-time race tracking all on one page. We should be so lucky during the Tour. Here's the Tour of California's announcement of the tracker. Over at Missing Saddle, Will Frischkorn is blogging his Tour of California, checking in with a long recap of yesterday's stage. His Team Slipstream, which had an amazing US Pro Championship ride as TIAA-CREF, has brought that momentum forward into 2007, and ride today with Jason Donald, 2nd in the General Classification, king of the mountains leader Thomas Peterson, and Taylor Tolleson and Peterson the top two in the young rider's competition. 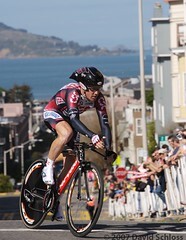 As for Frischkorn, he had a front-row seat when Gerald Ciolek went down on Monday in Santa Rosa. His previous three posts show how narrowly he missed Ciolek's bike. It sure helps to have Jens Voigt and Stuart O'Grady setting up your sprint. Juan José Haedo, newly signed by Team CSC, found that out today as he took the Sacramento sprint finish by a very healthy margin in front of Luca Paolini of Liquigas and Thor Hushovd of Credit Agricole. Haedo, the Argentinian sprinter who won two Tour of California stages for Toyota-United last year, notched his first victory for Team CSC with a beautiful burst to pull clear of a premium field of sprinters. A three-man break of Credit Agricole's Christophe Laurent, Colavita's Irish national champion David McCann, and Priority Health's Omer Kem got a five minute gap and absorbed many of the day's bonuses, but they were ultimately captured before the pack reached Sacramento. "It was way too windy for one guy," Pate said at the finish. "I hadn't done that run in before, and I was hoping for some trees, or something, some kind of windbreak, but it didn't happen ... It was just an opportunity that I decided to take that didn't work out." 3) Thor Hushovd, Norway, Credit Agricole, s.t. 4) Allan Davis, Australia, Discovery Channel, s.t. 5) Gerald Ciolek, Germany, T-Mobile, s.t. 6) Graeme Brown, Australia, Rabobank, s.t. 7) Greg Henderson, New Zealand, T-Mobile, s.t. 8) Ivan Dominguez, Cuba, Toyota United Pro, s.t. 9) Hilton Clarke, Australia, Navigators Insurance, s.t. 10) Paolo Bettini, Italy, Quick Step, s.t. 11) Fred Rodriguez, US, Predictor-Lotto, s.t. I'm going to skip the GC, since almost 30 riders sit within 15 seconds of Levi Leipheimer, who still leads the overall by more than a second over Slipstream's Jason Donald and 5 seconds over Ben Jacques-Maynes of Priority Health. So race officials at the Tour of California made a decision yesterday to neutralize the finishing circuits of Santa Rosa after a big crash caused a massive pileup, isolating a number of highly placed riders, including race leader Levi Leipheimer of Discovery Channel, and 2nd-placed Jason Donald of Team Slipstream. Ken Conley at Spare Cycles found himself right on top of the crash, and got some great pictures of the pileup and the finish. Over the last decade or so, the UCI has established a neutral zone at the end of races. Initially, this was set at 1 kilometer to ride, specifically targeting the sport's fairly common final-sprint crashes. Each time a big crash has affected a race a little bit outside the current neutral zone distance, the sport has expanded it, first to 2 kilometers, then to 3 km, where it stands now. But yesterday's crash didn't happen at 3.2 kilometers to ride -- it was at nearly 10 kilometers, when some Bott's dots relocated a rider's wheel, causing a chain reaction in the field. Seriously. Neutralizing the race from 9km. It's just February, but this is not cool. "Due to the size of the crash and the large number of riders that went down in the crash, our panel of commissaries made a decision to award all the riders with the time of the winner," Jim Birrell, race director said. "I think it was a fair decision and the right decision." "Thinking that I was going to be in the leader's jersey is an honour and a dream but that is counting chickens before the eggs hatch," Jacques Maynes said. "The commissaries ruling is sticking and we just have to live with that. We have a lot more racing and my team is motivated to keep going and to race our hearts out. I'm trying not to pay attention to all these details and get on with the job at hand." Jacques Maynes adds, "I'm not in a position to question the commissaries and I just gave to live with it keep racing my bike. I'm paid to pedal and they are paid to make those decisions. It is hard to swallow that but that is what we have to do." CN also reports that no protest was lodged. 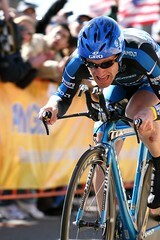 David Zabriskie's crash was apparently out on the road, before the race entered Santa Rosa. Head and wrist injuries forced him out of the race, but X-rays came up clear. For me, I think the decision is counter to the traditions of bike racing. I've always been a fan of Leipheimer's, but it rubbed me the wrong way to hear him, in a post-race interview, talking about how he had come out and “defended the leader's jersey” in his hometown. I hope Discovery Channel didn't pull any strings to manipulate the finish. Rabobank's Graeme Brown led a down-under charge into Santa Rosa today, outsprinting New Zealand's Greg Henderson of T-Mobile and fellow Australian Allan Davis of Discovery Channel. A crash in the field with about 6 miles to ride led to chaos in the lead group. Santa Rosa resident Levi Leipheimer, the race leader, and Team Slipstream's Jason Donald both were involved in the crash during a downtown circuit of Santa Rosa. Leipheimer initially finished 35 seconds back of the stage winners, but judges decided to neutralize the finishing laps of Santa Rosa, and therefore the crash, which leaves him in the race lead. Other team leaders may have been caught out behind the crash. CyclingNews reports that Dave Zabriskie was involved in the crash, and sent to the hospital; he apparently didn't finish the stage. More as it comes in. Looks like the perfect place to plug the Vs. coverage at 10 Eastern. The ballyhooed Tour Tracker from race organizers looks fantastic, but isn't working yet. It's supposed to be powered by the CSC GPS system discussed in last week's Wired News story. Versus, formerly Outdoor Life Network, will be offering same-day coverage of the Amgen Tour of California, kicking off this Sunday. The network will typically air stage coverage at 10 or 11 p.m. Weekend stages will run for two hours, from 5-7 p.m., with an hour-long rerun at midnight Eastern. Coverage will feature the network's usual cycling commentators, Phil Liggett, Paul Sherwen, and Bob Roll. 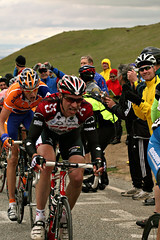 The route for the 2007 Amgen Tour of California was unveiled Wednesday. The eight stages run from February 18-25th, 2007. San Francisco, Sausalito, Santa Rosa, San Jose, San Luis Obispo, and Santa Barbara are again host cities for starts or finishes, and Sacramento, Stockton, Seaside, Solvang, Santa Clarita, and Long Beach (that's right, only one host city that doesn't begin with “s”) host for the first time during the 2nd annual run of the first big stage race of the season in the United States. Sixteen teams will take the start, including a number of ProTour teams. Already committed are Discovery Channel, Team CSC, and Predictor-Lotto (formerly Davitamon-Lotto). Participating riders won't be announced until race time approaches, but one rider who looks unlikely to participate is 2006 Tour of California champion Floyd Landis, who is defending himself against doping charges as a result of a doping test after Stage 17 of the Tour de France. Versus (formerly the Outdoor Life Network) will televise 14 hours of race coverage. 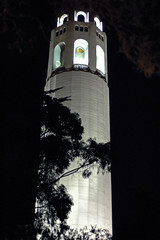 Prologue: San Francisco - essentially a repeat of last year's 1.9-mile prologue along the Embarcadero, then up Telegraph Hill to Coit Tower. Stage 1: Sausalito to Santa Rosa - Almost 100 miles, encompassing Mt. Tamalpais State Park, and the climb of Coleman Valley Road, then finishing with three laps of Santa Rosa. Stage 2: Santa Rosa to Sacramento - Santa Rosa is the only city to host a finish and a start. Passes through Davis before 3 laps in Sacramento, finishing at the State Capitol. Stage 3: Stockton to San Jose - Farm day, passing through Livermore, and including the toughest single climb, up Sierra Road in San Jose. It's 94.6 miles in all. Stage 4: Seaside to San Luis Obispo - Featuring oceanside Highway 1, the longest stage of the race goes more then 130 miles with three King of the Mountain primes. Passing Hearst Castle, finishing at Osos and Monterey in San Luis Obispo. Stage 5 ITT: Solvang - Solvang hosts one of the biggest centuries in the U.S. The riders only have to cover 14.5 miles, with the start and finish two blocks apart. Last year's ITT was hillier, longer, and earlier, running on Stage 3. Stage 6: Santa Barbara to Santa Clarita - 105 miles, 4 KOM climbs, 2 sprint lines. Start near the beach in Santa Barbara, through Ojai, Santa Paula, the Balcom Canyon that was a fan favorite last year, and 3 circuits in Santa Clarita. Stage 7: Long Beach Circuit Race - Covering part of the course of the Long Beach Grand Prix, 10 laps of 7.8 miles for a 78-mile day. The Amgen Tour of California will once again kick off the high-level pro season in the United States next year, running from February 18th-25th from San Francisco down to Long Beach. Floyd Landis - (insert superlative), (desktop size available) by whileseated. Floyd Landis, badass, by bigempty. So I'm going to miss the Tour of California next month, but it's looking to be a big race. The final team roster is out, and it's mostly the same as last year's Tour de Georgia, but with Davitamon-Lotto and T-Mobile added to the Euro squads. The Tour of California looks like it should be TV and spectator friendly, highlighted by a 3-km Sunday prologue in San Francisco, from the Ferry Building to Coit Tower, and weekend stages around LA, including a beachfront finish on Friday, Feb. 24, and a finishing circuit race over a 12.2-km circuit in Redondo Beach. Covering 600 miles in all, the race has a UCI 2.1 rating. Three of the teams are having training camps in Solvang.